Forza Horizon 4 has received its first major post-launch update on Xbox One and Windows 10 PC. 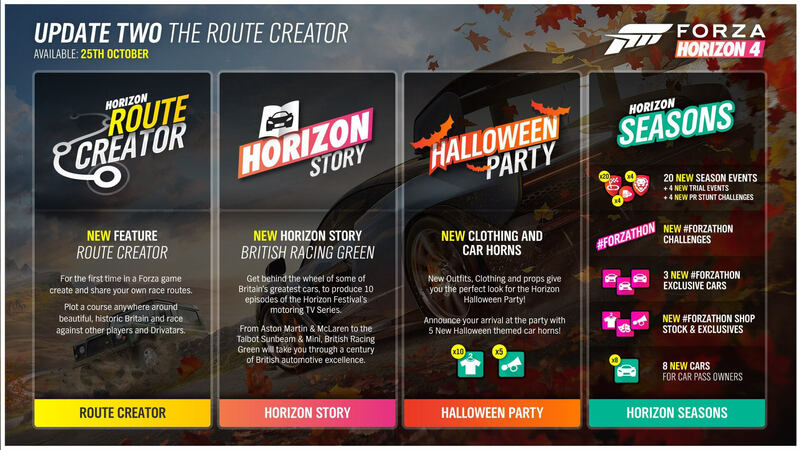 This release features the eagerly-awaited Route Creator, as well as the ‘British Racing Green’ Horizon Story, a selection of new Halloween-themed clothing items, alongside a bunch of fixes and various in-game improvements. It’s worth noting the update was originally scheduled to release on October 25th to coincide with the weekly seasonal change but has been instead pushed forward to today – Tuesday, October 23rd. 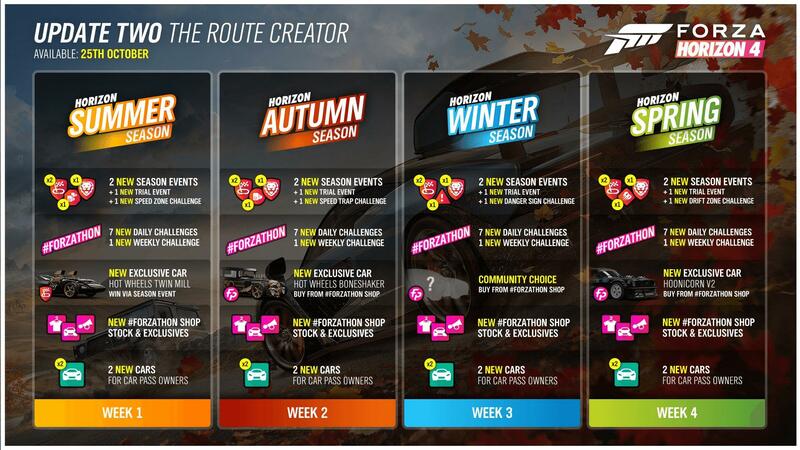 The Route Creator is a long-awaited addition to the Forza franchise. This feature allows aspiring route designers to create custom courses of up to 40-miles in length from any Asphalt, Dirt or Cross-Country Event starting location. Players can simply drive their car to draw a custom route, and place checkpoints wherever they desire. Playground Games has also updated the Blueprint Creator to allow you to use custom routes. Meanwhile, the ‘British Racing Green’ storyline will explore a century of cars built on the British Isles. You can access this Horizon Story in the village of Broadway once you’ve hit Level 50. Earning Influence from this story thread will unlock a new Quick Chat phrase, a new unique clothing jacket, and the classic Bentley 8-Litre. In addition to the above features, the seasonal roadmap for the next four weeks has also been revealed. New exclusive cars, events and challenges are all available to check out, including the addition of two new 50th Anniversary Edition Hot Wheels. The Twin Mill can be unlocked by winning a unique seasonal event in Summer, whilst the Boneshaker can be purchased from the Forzathon Shop in Autumn. 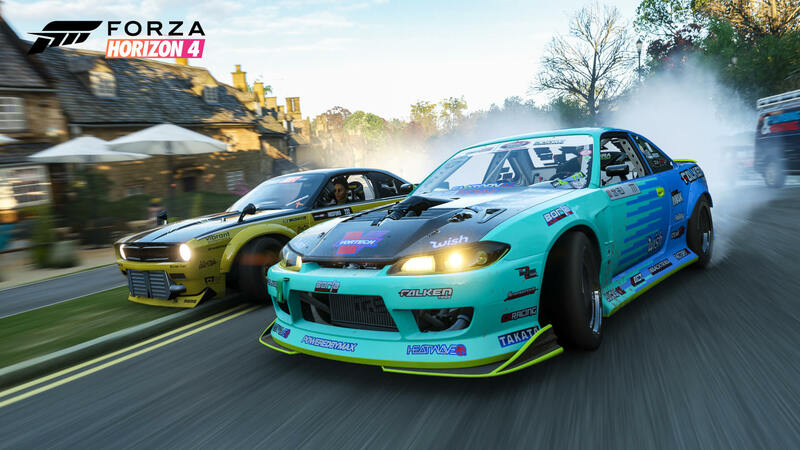 Winter will see a community choice car up for grabs in Forza Horizon 4 from the first month of exclusive seasonal cars, whilst Spring introduces Ken Block’s Hoonicorn V2 stunt machine to the Forzathon Shop. Every week, to coincide with the season change, you’ll be able to enjoy themed seasonal events. These incudes two bespoke Seasonal Championships, one cooperative-based Trial, and one elusive PR Stunt. 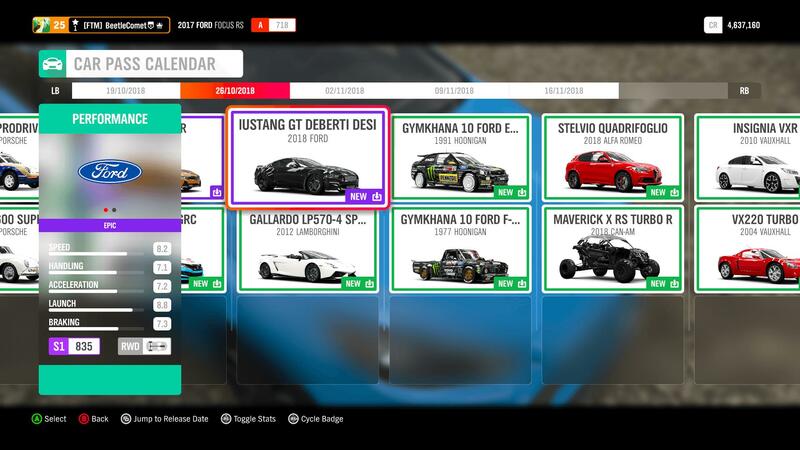 As for Forzathon, there will be seven new daily challenges and a new weekly event to complete as each season progresses. With this latest update, Playground Games has also fixed an issue for rewards not being awarded after finishing Seasonal Championships and Trial events, as well as one that caused progression loss on Forzathon challenges. This will make all these events and challenges far more enticing and rewarding to complete. As mentioned, this update also introduces some new Halloween-themed clothing items into Forza Horizon 4 that can be unlocked by simply playing the game. These include some new spooky outfits and facial masks, such as the witch’s nose and a pumpkin head, as well as Police outfits so you can represent your line of duty when driving Police cars around Britain. There are also some odd alien outfits should you wish to pretend you’re from an alternate universe, as well as various Halloween-inspired t-shirts. The Forza Horizon 4 October Update is a 3.49GB download on Xbox One X consoles – and it’s available to download now. You can find the complete patch notes over on the official Forza Support website. Forza Horizon 4 launched on October 2nd, 2018 on Xbox One, Windows 10 and the Xbox Game Pass subscription service. It achieved more than two million players during its launch week, making it the fastest-selling enry into the open-world racing series yet. Microsoft celebrated the release of Forza Horizon 4 with a special launch event at the tranquil grounds of the Goodwood Estate in beautiful Britain, which saw professional Hoonigan driver and personality Ken Block tearing up the countryside in his Hoonigan V2 – which will be available to all Forza Horizon 4 players later this month from the Forzathon Shop.